Ethnic Scrapbooking: What is Ethnic Scrapbooking? What is Ethnic Scrapbooking? It's Lisa Sanford's philosophy about life really. Living a life of cultural awareness and preservation. ETHNIC SCRAPBOOKING is the first multi-culturally inspired book that offers specific ways to include examples of culture and ethnicity on a scrapbook page. With over 100 full-color images, and ideas from over 40 countries and cultures, this heartfelt book will inspire a wide audience, no matter your race, nationality or ethnicity. Lisa Sanford's ideas encourage the reader to live a lifestyle of cultural awareness and preservation. Memory keepers of all skill levels will be able to add new cultural perspective to their projects with ideas presented by Lisa. I've always had in interest in cultures, thanks to my parents who taught me to embrace those different from myself. It's the reason I moved to Washington, D.C. for the diversity. Now with 5 kids who go to schools where over 29 countries are represented, my kids interact with people from different cultures every single day of their lives. "Ethnic Scrapbooking is an idea book that I wrote for every scrapbooker. It's a fresh new way of looking at your photographs and memories. It's a way to share the traditions and nuances of your own ethnic heritage, or explore other ethnic cultures too." Please visit my BLOG to see what I'm up to. Ethnic Scrapbooking. What picture does this title conjure up in your mind? Faces in a rainbow of skin tones wearing exotic costumes from foreign lands? How about this...take a look at yourself in a mirror, take a look around your home, and at your family. Each and everyone of us has ethnicity. Ethnicity is a characteristic inherent in us from before our birth. Ethnicity exists whether you are a new comer to this country (U.S.A) or have roots going back many generations. Have you ever wondered why you do the things that you do? Why you throw a pinch of salt over your left shoulder when you spill it? Why Japanese people never give gifts of 4 items? Why do we say "bless you" when someone sneezes? Often we take for granted, the little things we do or say, never questioning why we do or say them. Just imagine all the wonder and wealth of information we would uncover about our culture and ourselves if we just took a closer look at our everyday world. Scrapbooking our lifestyle has become a trend in the industry, returning to the underlying reasons we love to scrapbook: To remember, to document, to pass on. Life is not just about the events in our lives, but the common everyday things that make us who we are. A big part of this has been shaped by our ancestors and the world around us today. Ethnic Scrapbooking explains how to pay attention to the role culture plays in your life and how to become a master observer of the world around you. 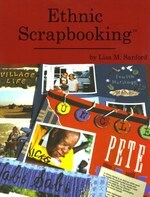 Visit WWW.ETHNICSCRAPBOOKING.COM to purchase the book, look for additional tips, contests, challenges, and resources.